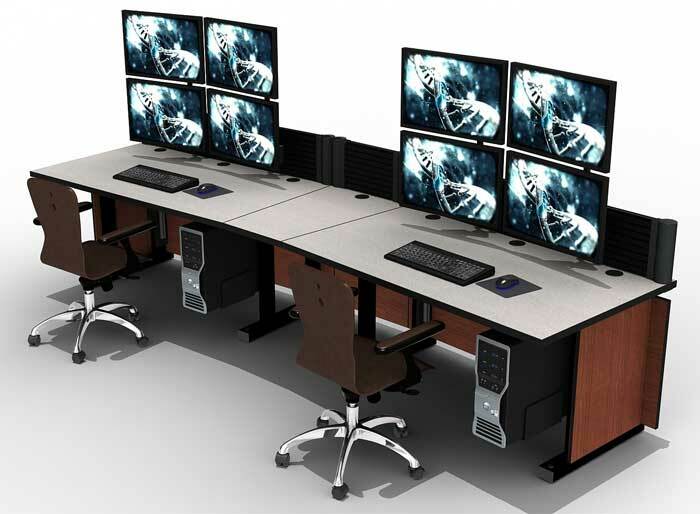 A modular and versatile furniture-grade design solution for critical operations and monitoring environments like NOC and control rooms. Modular design console furniture that meets the demand of 7×24 environments without the expense. Above all, retains style and aesthetics. Of course numerous straight and corner module options allow for extreme configurability to optimize useable space within the room to maximize operator productivity. Economical and robustly designed open-air slat wall console solution with integrated power and cable management. 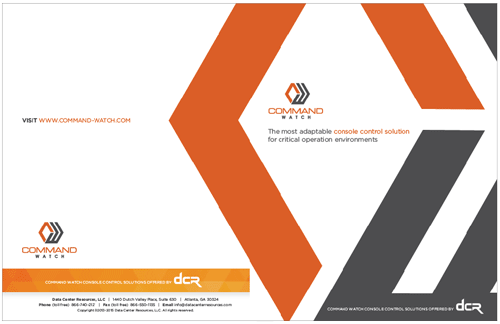 Command Flex is an economical and robust console solution. Command flex targets control rooms that need to perform while staying within tight budget realities. 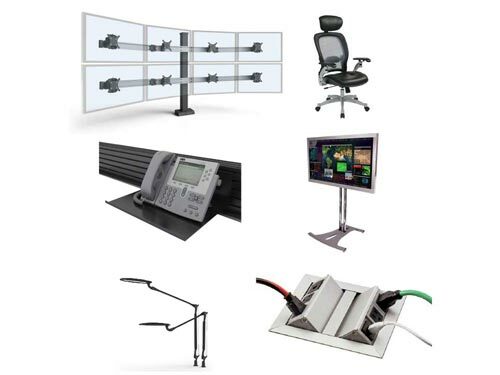 This line of consoles includes all the elements required for high productivity in a network operations center or control room at much lower cost than a fully enclosed desk. 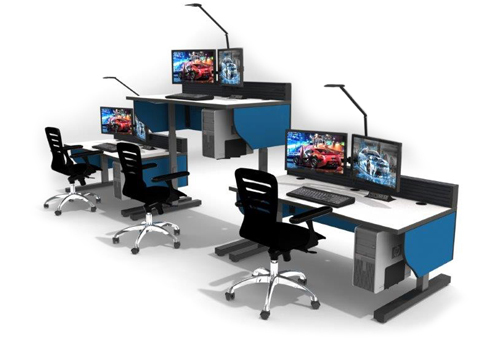 Furniture-grade 7×24 console with adjustable-height work surfaces for operator ergonomics and comfort. Monitoring applications that require the operator to be relatively stationary can create uncomfortable and possibly injurious working conditions. Accordingly, Command Flex Adjustable-Height consoles help to alleviate operator fatigue by providing an electronically adjustable work surface height. Custom Accessories Provide Added Functionality. 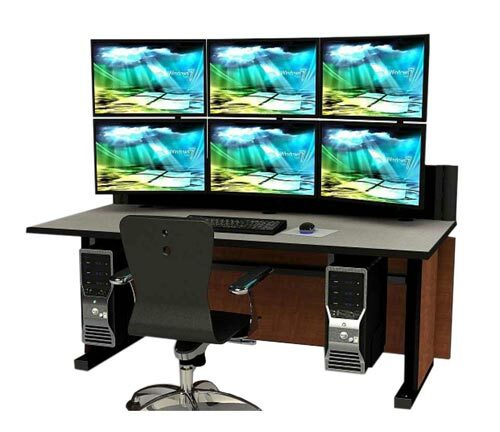 Console furniture provides operators with a productive work area for critical applications. The requirement for other specialized items for console desks further enhances productivity. In addition, we manufacture custom enhancements attached to the console including cases for hardware, locking storage units or shelving for top of slat wall. An ultra-thin and near-seamless matrix of displays provides critical content to your command center in high definition. 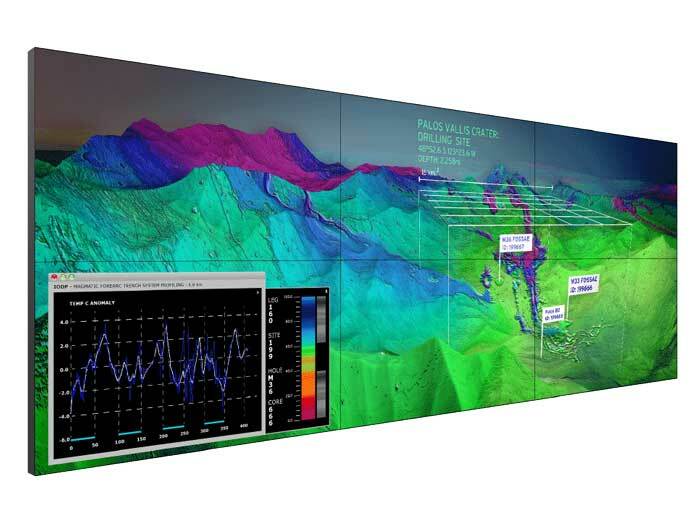 The next-generation Matrix Data Wall System delivers a new level of visual performance. 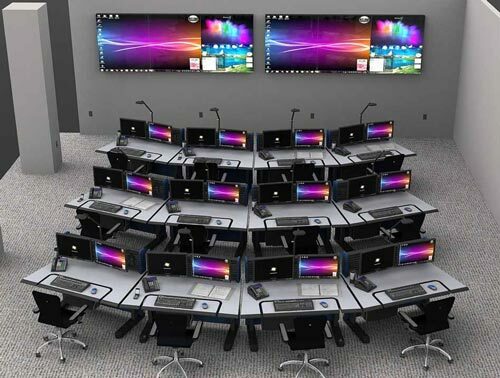 Our wall system optimizes uninterrupted 24×7 NOC operation. This immersive, flexible Matrix solution combines the industry’s thinnest profile ultra-narrow bezel LED LCD wall system. Additionally, the system supports extended operation, requires minimal installation space. 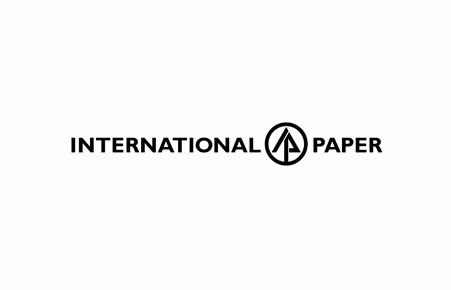 As a result our systems offer outstanding improvements in design and service. 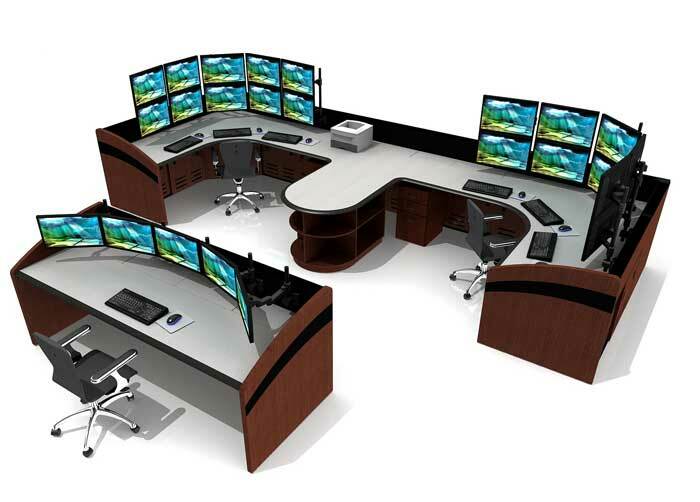 We specialize in console furniture for NOC and control room environments. Command Watch provides modular and versatile furniture-grade 7×24 solutions designed for critical operations and monitoring environments. The Command Watch console is a modular system. Desks include a sturdy steel frame and the industry's most flexible slat wall. The fully enclosed flagship Command Watch console is a quality solution designed for 7x24 operations. Command Watch integrates cable management and power features while providing improved safety and aesthetics in any NOC or control room space. Command Flex features a budget-friendly, open solution with the same strength and functionality of Command Watch. Command Flex is available in fixed and adjustable-height work surface options. Learn more about the Command Watch line. Learn more about the Command Flex line. Economical and robustly designed open-air slat wall line of furniture with integrated power and cable management. 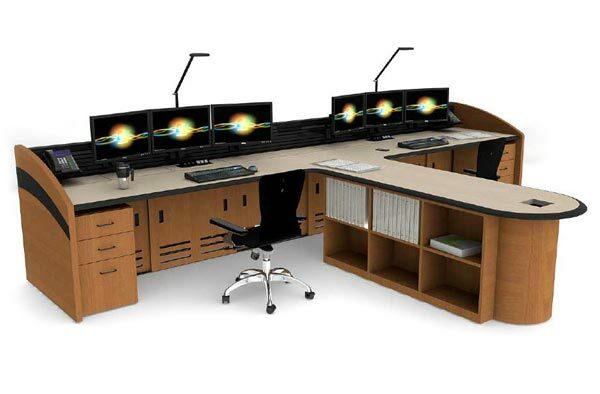 Modular furniture designed to endure the rigorous operator demands of NOC's, EOC's, Control Rooms and Command Centers. 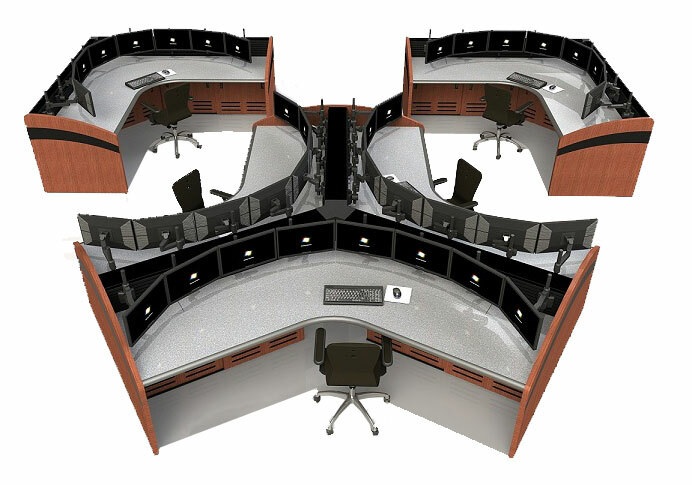 Command Flex Adjustable-Height for control rooms is a sit/stand console intended for emergency response, police dispatch & 911 call centers. With adjustable keyboards and monitors, the Command Flex console allows operators to customize their workspace for optimum ergonomics and comfort. Above all, Command Watch is especially useful in environments requiring operators to constantly focus on their workstation. Learn more about Command Flex Adjustable Height Console Furniture. console system and installation service for their critical facilities.